For the last week Jay-Z's Empire State of Mind has been the running soundtrack in my head. I don't even love Jay-Z ... but that song is pretty damn catchy. The thought of going back to NYC again - with the boys - because of something I worked on no less, had me more than excited. Tuesday morning we were off and running before 6am. When we got to the bus terminal I had a near panic attack to find what looked like an entire bus of people already waiting - all with reserved tickets - just like us. How would we get 5 seats close together?! Turned out there was MORE than a busload of people... they actually had to call in a second bus to come as well. We got on the 1st bus just ahead of the massive amount of high school kids (who you would have think would have gotten their own charter bus) and made it to the very back so the boys could sit together and Al and I could sit right in front of them. 55 bathroom trips and about 200 'are we there yet's later (but still better behaved then the high school kids might I add)... we were Finally in NYC!!! We walked to the Millennium Hotel just to ask if they would keep our bag until check in (since it wasn't for about 5 hours) when we realized the people in front of us were checking in early. And our room was already ready! We were on the 29th floor (out of like 50 I think) and the boys were Amazed at the view. After we settled into the room we were right back out to start our day. It was so gray and gloomy we were hoping the rain would hold off. Spoiler alert, it didn't. Al and I seem to have this running theme ... something big is happening? It will rain. Or snow. Or there will be an injury of some sort (usually to me). Lets recap. Our wedding day? Dark and rainy. The Big Guy's first few birthdays? Snowstorms. 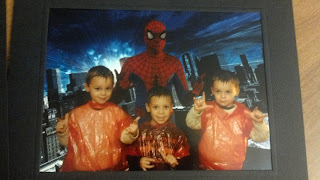 The year we baptized the boys and had a giant outdoor party planned - in JUNE? Freezing cold and windy. Summer vacation in New Hampshire 2 years ago? Total monsoon washout. 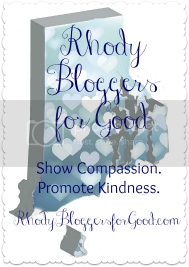 Vacation in New Hampshire this past summer? Rainy again but we were able to make it work. Falling down stairs totally sober because I can't rock my kickin high heels too well - the night before we leave for our anniversary and spraining my wrist? Check! I don't know WHY this happens, but it so does. So of course it hadn't rained in weeks but because we were going to NYC for 2 days - it would be the only 2 days they would see of rain. 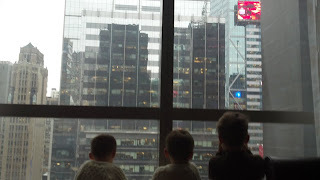 We hit Times Square and made a beeline for Toys R Us, the Disney Store and the M&M Store. The boys were loving it despite the sprinkles. By the time we were getting lunch we were about to hit Famiglia's Pizza on the advice of a friend when the boys noticed Applebee's across the street. And begged to go there instead. (Who passes up pizza. Seriously!) During our $70 Applebees meal (yup, absolute craziness) it started to pour. I had thought ahead when I saw the forecast and hit up Target the day before and got rain ponchos (for a dollar and change a piece by the way) because I was not going to pay who knows how much ($6 a piece it turns out) in the city. I'm thrifty like that! BUT the one size fits all was giant on the boys so Al had to tie up the backs ... which resembled the way you would bustle a wedding dress. Too funny! They drew so much attention on the streets it was crazy. In fact, as we started to cross one street I noticed a camera down near their faces and a man with a NEW YORK TIMES press pass asked if he could speak with us. Turns out they were doing a rain story and wanted a photo. He said the kids were so cute he just had to use them. How cool is that! He said his mom was a fashionista long before there were fashionista's and she had all boys so when he saw what they looked like he just had to photograph them. We hit up FAO Schwarz. As a kid I went with relatives and my Aunt Lynn bought me a teddy bear there that I cherished. From the moment I saw the giant giraffes there in March when Al and I went I knew I had to bring the boys there and that the Doodle Bop would be over the moon given his giraffe obsession. They were all so excited. 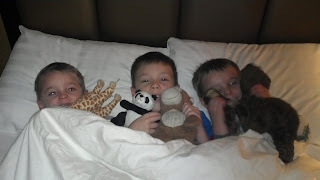 We let them each pick out a small stuffed animal and as predicted the Doodle Bop got another giraffe (to bring his giraffe total to 3) ... Big Guy got a panda bear and the Bunny Bee got a monkey that he named Banana. Uh huh. We even got sucked into getting their photos taken with the Real Spidey. Where of course there are no prices listed but we thought hey just one picture. Um no, they don't tell you till after you have to purchase them in twos. TWOS! For a $22 minimum. So yeah. 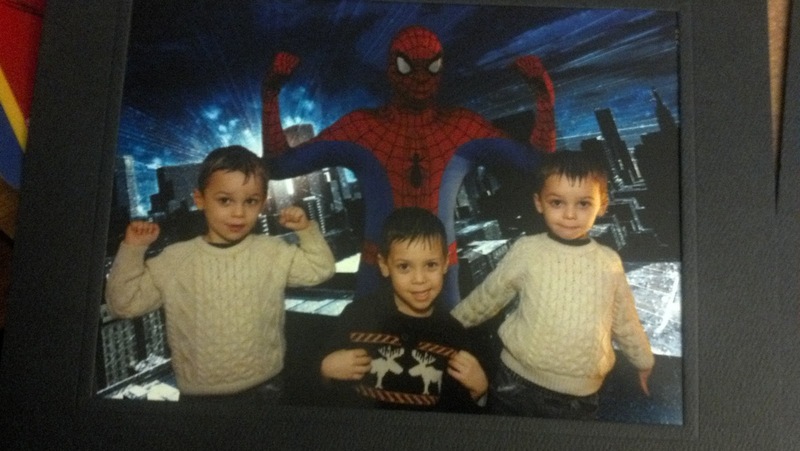 At least my kids are pretty darn cute. We hit up the tree in Rockefeller Center and the Lego store... then ventured back to the hotel to get ready for Conde Nast's launch party for Santa's Hideout at the Bowlmor. So.much.fun! The boys were in awe of the sparkly pins hanging from the ceiling, the lights and the whole party once we were inside. So much kid friendly food, desserts, hot chocolate, cider and more. I had my cards read and the twins got their faces painted. It was too funny because they each sat separate but picked the same thing - not knowing what their brother was getting. Spidey faces. And all the boys bowled the night away. 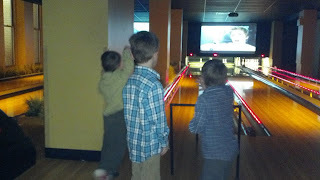 They alternated between bowling the big balls on their own and using a little help, like here. Getting their very own swag bags at the end may have just been the highlight of their night! We walked back to Times Square to see the lights again, hit the Hershey store and then went back to the hotel. Two hours past their normal bedtime and they were still wide awake! We had fully planned to get up early and start the next day by hitting the Today show to get our cuties on TV, but when we woke up not only was it pouring rain, the Bunny Bee's face was totally swollen, red and itchy. He has on one other occasion had an allergic reaction to having his face painted... but it's been painted a few times since with no problems. And having washed it all off before bed I thought for sure he would be fine...but the tip off should have been that he was already smudging it that night. I thought it was him just wanting to touch it, but maybe it was starting to itch and he didn't want to say anything. 2 chewable Benadryl and a few hours later, the swelling was less but still totally noticeable. Between that and the rain we actually tried getting an earlier bus home but I refused to pay $75 in fees to change tickets. $75 to change buses by a couple hours? Really? By that time we were drenched and I was soooo over the rain. We went back to the hotel, dried off and checked out. The Doodle Bop had a total teary eyed breakdown over not having had a taxi ride (which he apparently has his heart set on) so we hopped into one to make the uber short trip to Midtown Comics. The boys were in heaven at Midtown. We literally had to drag them out of the store when it was time to go ... after Al got them each a comic book of course. 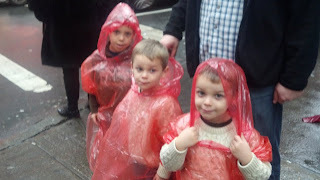 We ended our trip by walking back to the Port Authority to get the boys lunch and wait for our bus home. By the time we left it was so dark and rainy the twins fell asleep within minutes. Love this shot of the Bunny Bee sleeping. 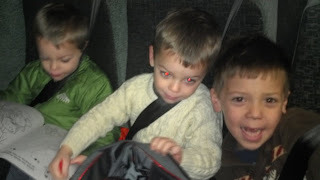 The ride home took forever and the twins cried multiple times after they woke up. We were in so much traffic. I even had a breakdown after passing the exits we would take to go home, only to get stuck in more traffic between Providence and Pawtucket. A 'we are never getting off this bus' breakdown as we waited to get back to the station to get our truck. 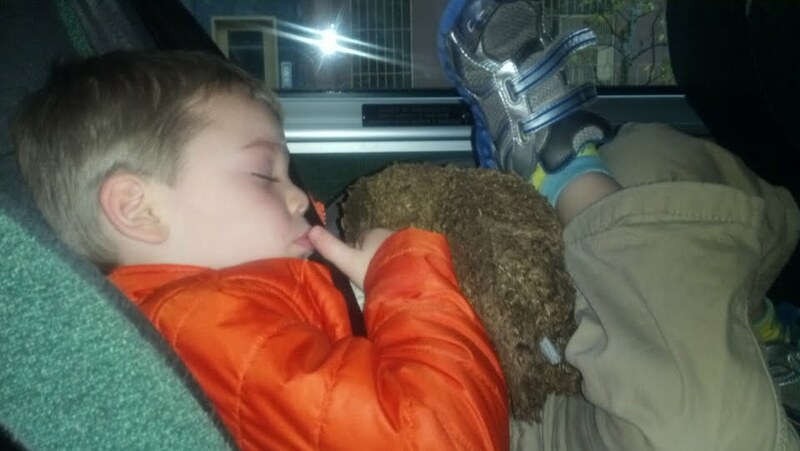 It was well about an hour before the boys bedtime when we finally made it home. Al and I decided we would never take the bus with the kids again. We will indeed just drive the truck to NYC next time. So much easier that way. Dinner... showers... PJ's. The Bunny Bee couldn't have been more happy to get into his own bed. Despite the 2 days of rain and darkness, it was still so nice to have the time away as a family. I'm hoping this is something the boys are big enough to always remember and look back on with good memories. Huge thank you to Conde Nast and Santa's Hideout for putting us up at the Millennium and having us at the launch party!!! I have so many more photos of our trip... look for a wordless photo montage later in the week.